In the photograph below, circa 1907-09, are these the rushing tramcars, crowded footpaths, cafes that William Royle was so concerned about? 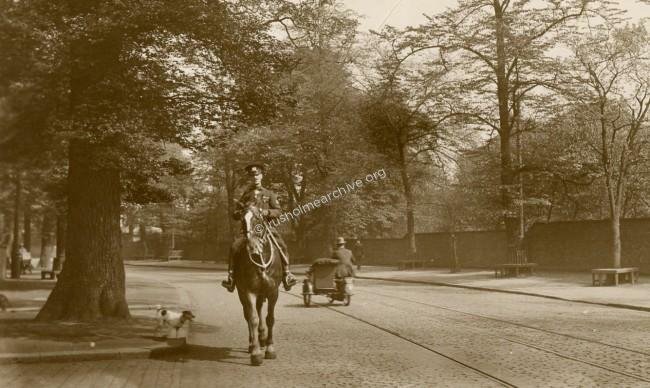 The photograph has been taken on the corner of Wilmslow Rd and the junction of Dickenson Rd, (looking north to Manchester). Postcard view above of Wilmslow Rd and junction of Dickenson Rd, (looking north to Manchester is dated Sept 1904. Most notably the tram is a single decker for this particular route, Brooks Bar to Belle Vue. 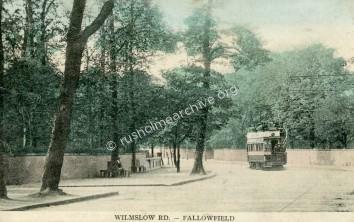 Read more about the tramcars and a detailed description of the photographs on the page, 'A Tour of Wilmslow Rd'. Photograph below, looking south and dated 1906. A similar viewpoint from the above photograph and a marvelous view of the Birch Villa Hotel. The photograph is not in the best of condition, however the action is very animated! In the image above you can see a large poster hoarding to the right of the Birch Villa Hotel. Behind the poster hoardings was Harry Leslie's 'Rusholme Pavilion' where for some 40 years there were very popular concerts. 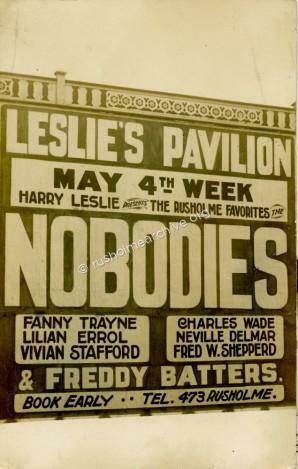 The large poster below was for a show in May 5th 1914. See the menu on the left for Harry Leslie and the Rusholme Pavilion. 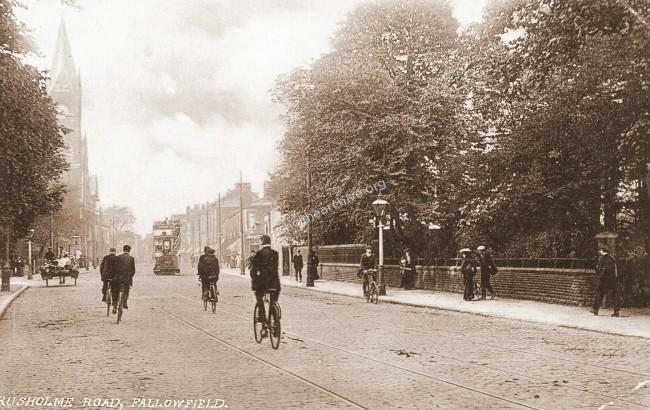 Fallowfield Brow, often referred to as 'The Boulevard' was always popular, photographed with residents leisurely spending time under cover of the majestic trees as carriages, trams, bicycles and carts passed by. Here in this undated photograph below, perhaps from the 1920's, a soldier on horseback is riding in a northerly direction. Look at the menu on the left for Fallowfield Brow and Oak Drive. Another view below of Fallowfield Brow but in this case it is the message on the reverse that is so poignant, almost brutal. 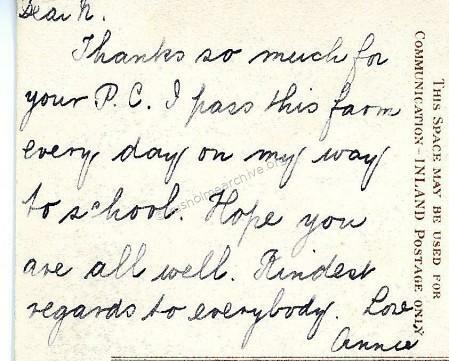 Remember that postcard views, (which are the principal means of illustrating rusholmearchive), were the cheapest and perhaps the quickest means of communication a century ago - guaranteed overnight delivery, or if local probably the same day on the second delivery! 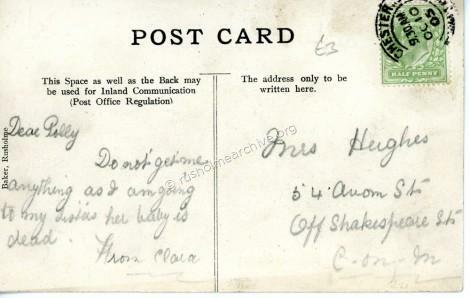 Postcards were the equivalent of our email and texting!. In July 1905 there was a visit to Manchester by King Edward VII and Queen Alexandra. It was proposed that the occasion should be marked with the declaration of the day as a Bank Holiday. 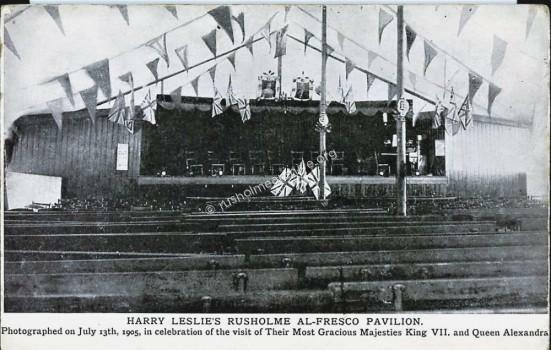 Harry Leslie decorated his canvas Pavilion with a variety of flags to celebrate the special occasion on July 13th as you can see in the card below. Rusholme residents were able to listen to bands playing in all three parks, Birch Park, Platt Fields and Whitworth Park. 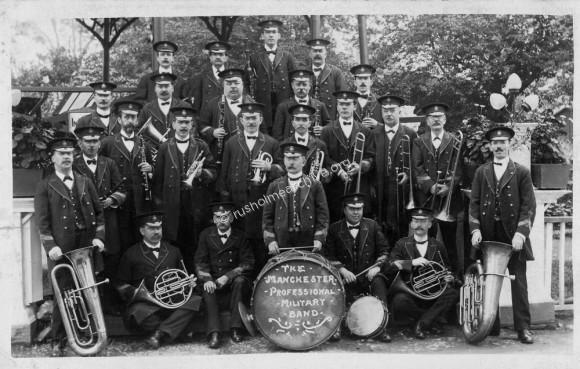 The Manchester Professional Military Band in the photograph below were billed to play in all three parks. To date I have not been able to find whether the band members had any military background. Searching Manchester newspapers I have found that the band appeared to have started some time in the 1890's and continued playing until the 1930's. If anyone has more information I would be pleased to hear from them. You can see more about each park and see the bandstands in each of the parks by looking at the menu on the left. 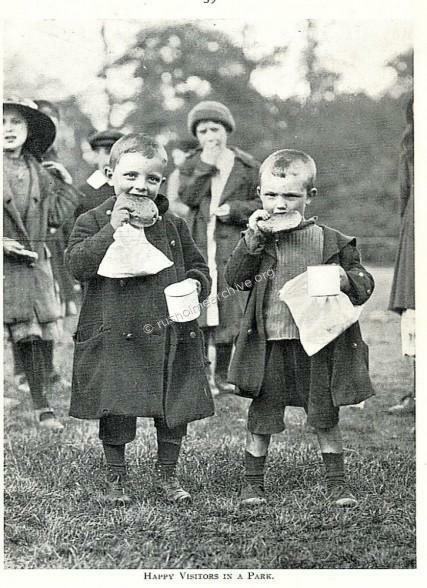 The Manchester Guardian reported that on Saturday 18th July 1914, deprived children from the poorest parts of Manchester had a day out in the park, having been given two pieces of cake, a bun, half a slice of bread and butter, and tea or milk. "Nearly two thousand poor children were taken from Ancoats to Platt Fields by tram yesterday, and spent a pleasant afternoon there notwithstanding the wet weather. It was the first of a series of trips that has been organised by the Education Committee, the Parks Committee, the Tramways Committee, and the readers of the Manchester Evening News. Twice a week from now till the middle of August these parties will be given in one or other of the parks until the children of Gorton, Bradford and Clayton, Ardwick, Miles Platting and Newton Heath, Collyhurst and Red Bank, Deansgate and Lower Hulme, and Upper Hulme and Chorlton-on-Medlock have all had their turn. The Ancoats boys and girls assembled in Birley Street Council School yard, and were put into the cars very quickly. Within half an hour the twenty-one cars that had been lent by the Tramways Committee were all full and moving off on their journey, and the children were disembarked quite as expeditiously. They reached Platt Fields at three o’clock, while it was raining, but they soon found shelter, either at the boathouse, where they were at once attended by a ventriloquist, or within the big Georgian Hall. There or thereabouts they stayed till the sun came out, consuming the provisions that had been furnished out of the “Manchester Evening News ” fund — two pieces of cake, a bun, half a slice of bread and butter, and tea or milk. Presently the sun began to shine, the band to play, and the children to come out, and at once the grass in front of the hall was covered with empty paper bags. The park-keepers, to their credit, were a good deal more amused than annoyed by it. Wickets were set up here and there, but the greatest crowd was at the lake, where there was a long, long queue outside the railings waiting for the chance of a journey round the island. From that time forward it was fine till half-past seven, when the tramcars ranged themselves once more outside the park, which emptied suddenly of it’s tumultuous juvenile population." You can see more children playing in the in the parks on the menu, 'A very Popular Park,' or 'A Gentle Stroll around the Park'. In the photograph below the Royal Coach used by the King and Queen for a visit to Manchester in 1905. 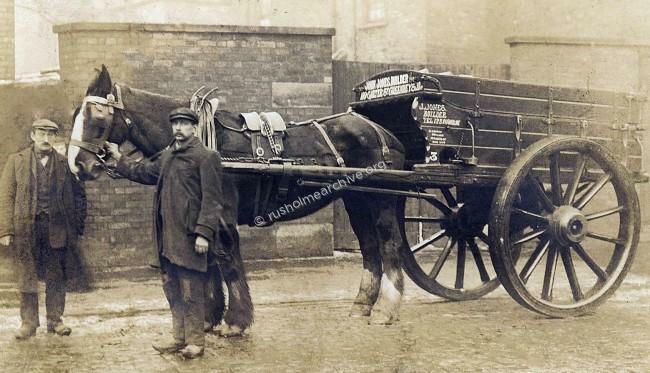 The coach was stored in the Rusholme stables, referred to in a 'Tour of Wilmslow Road'. There was another Royal visit on Monday 13th July 1913, see the menu on the left. 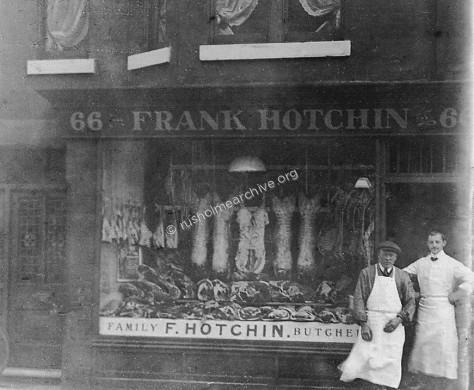 Also on the page 'A Tour of Wilmslow Road' you can get a glimpse of the western end of Dickenson Road, below is a photograph of Frank Hotchin, Butcher, 66 Dickenson Road. "The 4th Volunteer Battalion of the Manchester Regiment was exercised on Saturday afternoon, being drilled in Platt Fields. Lieutenant Colonel J. B. Pollitt had a record parade, about 650 of all ranks being in uniform. The Service dress was worn, for the first time on a Manchester parade, and the strength of the corps on this occasion can be taken as evidence of the growing popularity of this uniform. 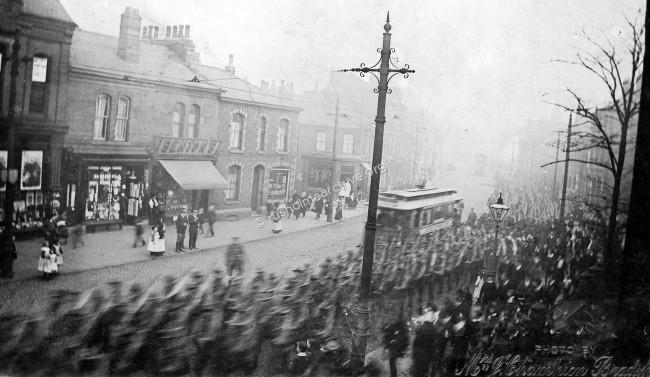 A big crowd accompanied the battalion to Platt Fields and watched the close-order movements of the larger body and the work of the signaling detachment. The street that can be seen on the left is Thurloe Street, there is a butchers shop on the corner called 'J Lockwood', the shop with the big sign, 'Bentons' I believe to have been a tobacconist. Whilst this photograph is not of the best technical quality it is certainly very animated. Famous Russian dancer at Military Hospital: Miss Lydia Kyasht accompanied by George Reynolds manager of Manchester Hippodrome visited the High Street Hospital, and presented the soldiers, among whom were a number of New Zealanders who had just arrived from the Dardenelles, with gifts from the Russian people. 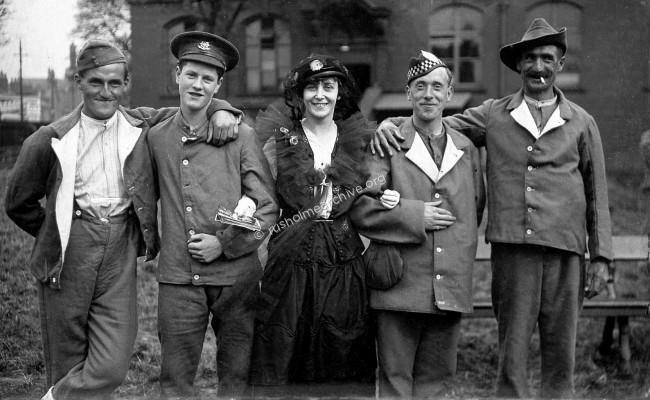 The photograph below was also taken some time during WW1, (1914-18). Soldiers recovering from their injuries were staying at Newbury, a Red Cross Hospital on Daisy Bank Road, Victoria Park. 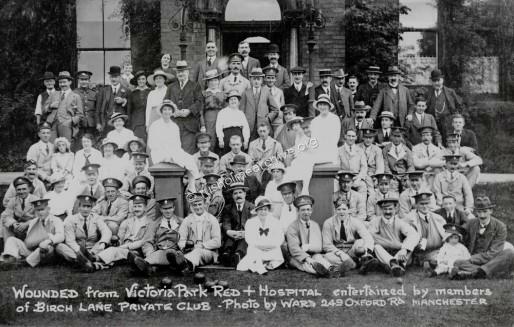 Here they are seen in a fairly relaxed mood having been entertained by the Birch Lane Members Club, (Longsight), where bowls and tennis was popular - see the soldiers holding racquets and bowls on the front row. Read more about WW1 on the page 'Rusholme Military Hospitals'. 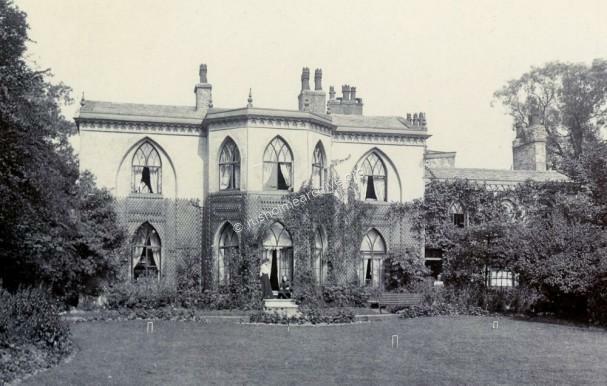 Platt Abbey was private residence built in the early 1800's on a plot of land bordered by Wilmslow Road and Norman Road. Author and playwright Ian Hay was born at Platt Abbey in 1876, the property becoming a hotel before being demolished in 1950 and replaced by two blocks of flats, Platt and Worsley Court. You can read more about Ian Hay and Platt Abbey towards the end of the page, 'A Tour of Wilmslow Road'. 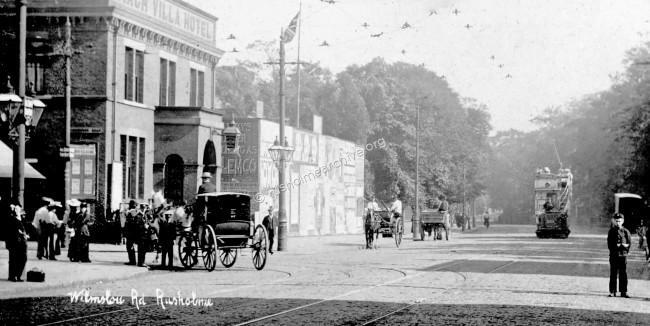 This website is about a history of Rusholme & Victoria Park. 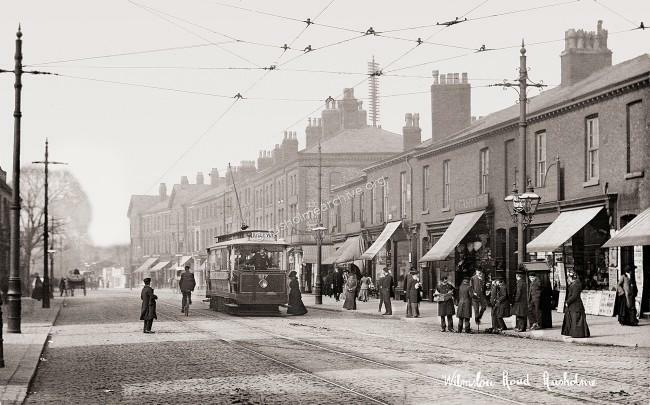 The archive has been compiled by a Rusholme resident who has been collecting old postcards, photos, books and other memorabilia which illustrate the ways in which the area has changed over the past 100 years. Unlike the books that have been written about Rusholme & Fallowfield this website will be a continuing project and will not have a cut-off date when the book has to go to press. Any new information about Rusholme & Victoria Park will always be welcome. I hope that visitors to the website will be prepared to loan such items and you may have family members or friends who have memories of past events in Rusholme that I can also record & publish on this website. I have enjoyed the last 10 - 12 years researching and writing about the history of this area. During this time I have been asked to give talks, presentations etc. about the history of Rusholme. Although I have usually been able to agree to these requests I have now decided, (albeit with some reluctance), that it can be too time consuming and would like to make it quite clear that in future any such requests will be politely declined. 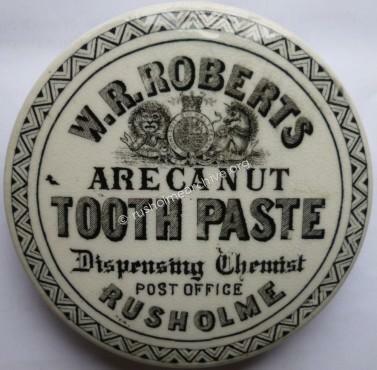 Up until the early part of the 19th century Rusholme was a village lying in the countryside to the south of Manchester & dominated by the two large estates of Birch, (owned by the Anson family), & the Platt Hall estate, (owned by the Worsley family). Click on the photo of the farm cart, this was taken circa 1865 by Helmut Petschler and clearly shows the name of Mary Broome, who according to the 1861 census was the farmer at Lower Oak Farm in Rusholme. 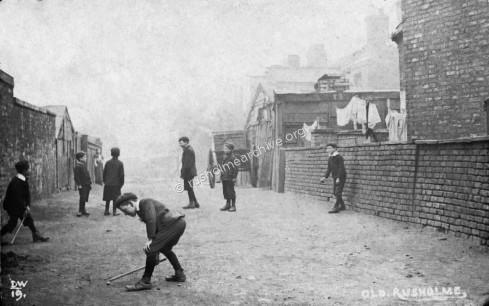 Thomas Lowe was a resident of Rusholme between 1836 and 1892; when he first arrived in Rusholme in 1836 the following is an account of the Rusholme that he knew as a young man. "The Green was perhaps the most charming feature of the village. It extended from Dickenson Road to what is now Thurloe Street. A low stone bridge crossed the clear sparkling brook and "children coming home from school" leaned over the parapets to see the water rippling over its pebbly bed. This same bridge was the favourite resort of farm-labourers, hand-loom weavers, and others, who foregathered here to discuss politics, or perhaps the gossip of the village. The chief excitement of the day was to see the stage coach pass on its way to or from Manchester; the pleasant jingle of its trappings, and the cheerful notes of its "echoing horn," drew the simple village folk, and especially the children, to watch this picturesque link uniting Manchester to the world beyond. A milder excitement was occasioned by the omnibus, which started from an old farm-house which stood a little way back from the road in what is now Victoria Park. This somewhat lumbering vehicle made several journeys to Manchester and back in the day, and carried passengers, if it could get them, at sixpence per head." 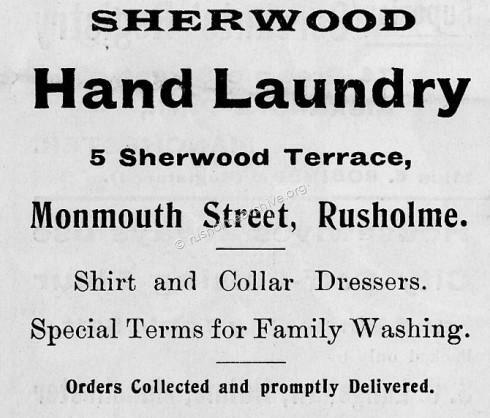 At the census of 1831 the township of Rusholme contained 179 houses and a population of 1,078. It was then emphatically a village, and depended chiefly upon its agriculture and its hand-loom weaving, which was carried on in most of its thatched cottages, the click of the shuttle being one of the most familiar sounds in the quiet rural life of those days. Gradually as Manchester industrialized the simple village occupations of weaving, farming inevitably gave way to the earnings in the huge mills, engineering works & other chemical works which lured people away from the Village Green. The 1873 Post Office Directory refers to the acreage of Rusholme as being 1480, (including Birch-in-Rusholme). 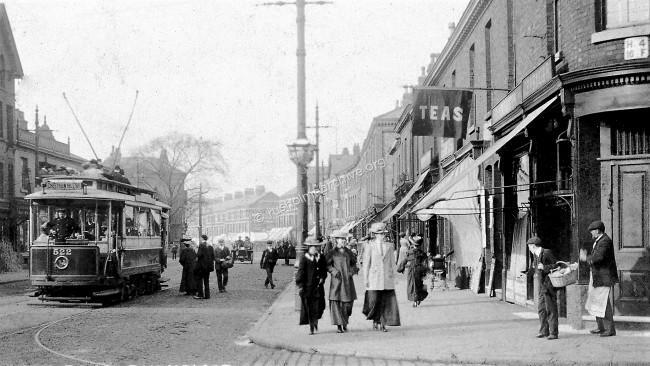 On page 3 of the website, 'Rusholme a century ago' there is more about the history of Rusholme. A westerly view below looking to the junction of Dickenson Road and Wilmslow Road taken around the 1860’s by Helmut Petschler. 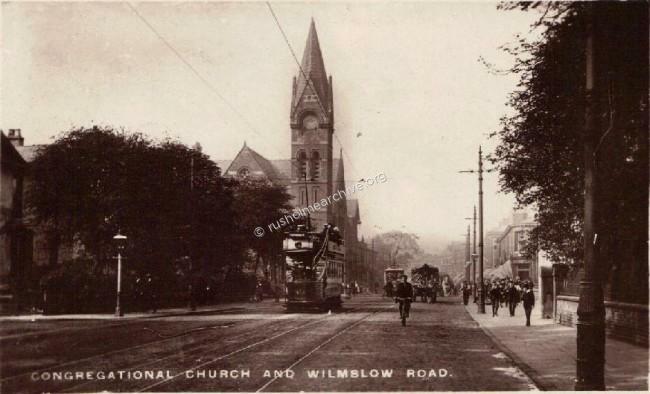 Rusholme Public Hall and Library is the stone-faced building on the right and the cottage on Wilmslow Road is now the site of Charles Wilson Motors. Rusholme, Wilmslow Rd looking north. 'Iconic' views' above of how this junction looked at the beginning of the 20th century. Platt Lane to the left, Dickenson Rd to the right in the photographs above. 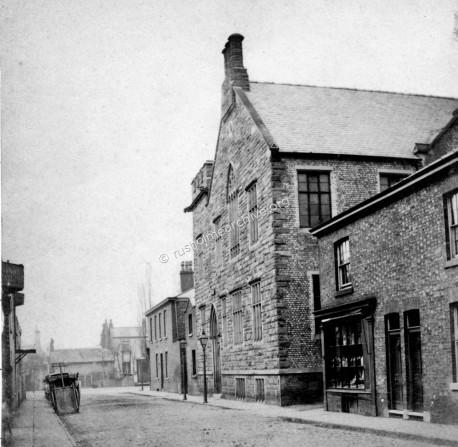 Birch Villa Inn, (Hardy's Well) on the right hand side, is still in business, having been on this site since the 1830's. 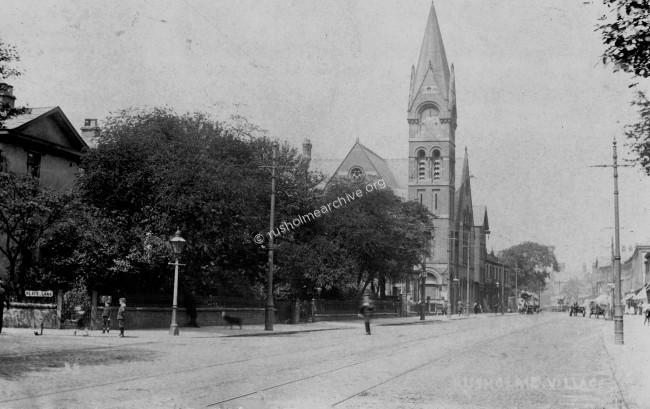 The Congregational church, on the left by Alfred Waterhouse, now demolished but in 1909 the spire & clock was a notable landmark. In the top photograph the gardens of the houses on the right have been replaced by Finglands Garage. 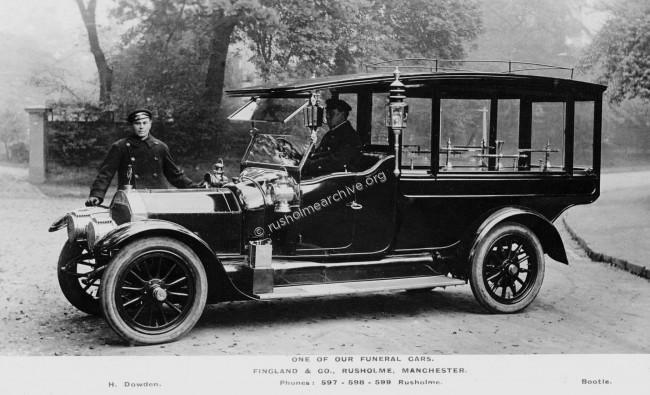 Charles Fingland worked for Rolls Royce as a test driver until 1907 when he started Finglands Hire Cars and Bookings. Originally running luxury limousines demand gave him the opportunity to expand into coach hire. Scheduled coach services followed and Finglands became the first coach company to run a scheduled service between Manchester and London with a coach having an on board toilet and radio. Bookings were taken at the head office in Manchester and also at an office in Southampton Row in London. Always a company with an eye on the future Finglands Airways took to the air in 1949 operating two Avro Ansons. The main use for these was an operation called "Combined Ops" where passengers were collected from their homes in Manchester taken to the airfield and transported by plane to Newquay. There a Finglands coach waited and would convey passengers to their hotel and provide outings during their stay. It also gave the opportunity to make excursions to see Blackpool Illuminations from the air! One of the pilots was Robert Fingland who had gained his experience with the Royal Air Force. However, the cost of operating airplanes was substantial and Finglands Airways ceased operation in 1952. The Fingland's family decided to sell the business following this and a sale took place to Mr Robert Bunning, the General Manager in 1954. 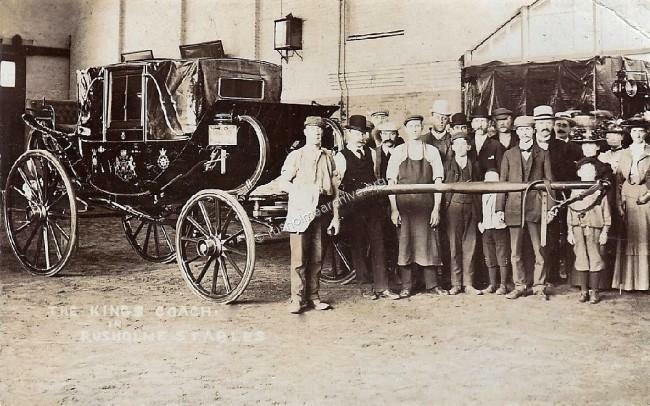 The coach business was expanded and a number of local companies were acquired. C Holt Coaches, South Manchester Coachways, Corkhills Coaches and Fieldsends Coaches. Eventually the Finglands Group of companies comprised of Finglands Coachways Ltd, Finglands Travel Agency Ltd and Finglands Garage Ltd. In 1992 Finglands was acquired by East Yorkshire Motor Services, but now in 2013 the bus operation has become part of the First Group and Finglands Coach company has been sold. The photograph below was found by Joop Campfens, who lives in Holland. He found it amongst some family papers and searching the web for the photographer’s name, (on the back of the cdv) he came across rusholmearchive and has now kindly given it rusholmearchive.org. The inevitable question is how did that photograph, taken 150 years ago find its way to some family papers in Holland? 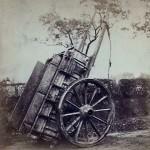 The photograph was taken circa 1860-65 by William Roberts, who William Royle described as the village photographer. 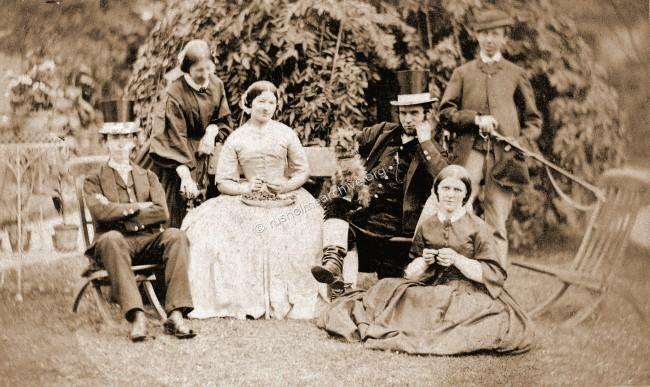 Although the sitters are not identified the man centre right with the top hat may be William Ulph, a member of the Rusholme Board of Health. 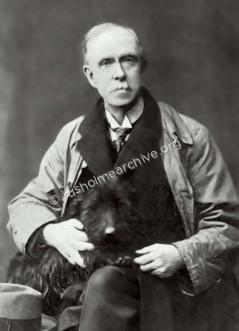 There will be more information on the page about Rusholme Photographers. George William Price photographed below at the 'Birch Studio', 124 Dickenson Road circa 1910. Baptised at St James, Birch-in-Rusholme 16 Dec 1906 his father, Thomas Henry Price was an upholsterer living in Kathleen Grove with his wife Sarah Annie. 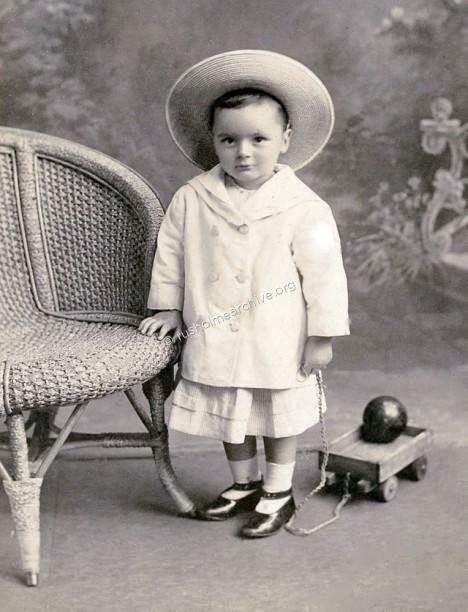 There was a prolific output of Rusholme family photographs by Frank Wyles at his Dickenson Road studio; see the page on Rusholme photographers. 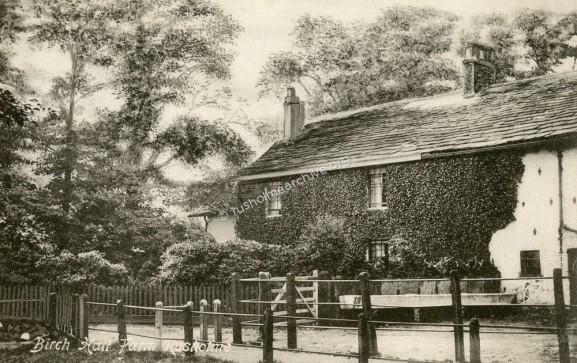 To emphasis the past rural nature of Rusholme the postcard below is dated 1904, the view is of Birch Hall Farm. It was situated approximately at the north-east corner of the grounds of Manchester Grammar School and the farmhouse was demolished in 1926. Below the card I have reproduced the message on the back of the card - presumably the reference is to Birch School, further down the lane(?). 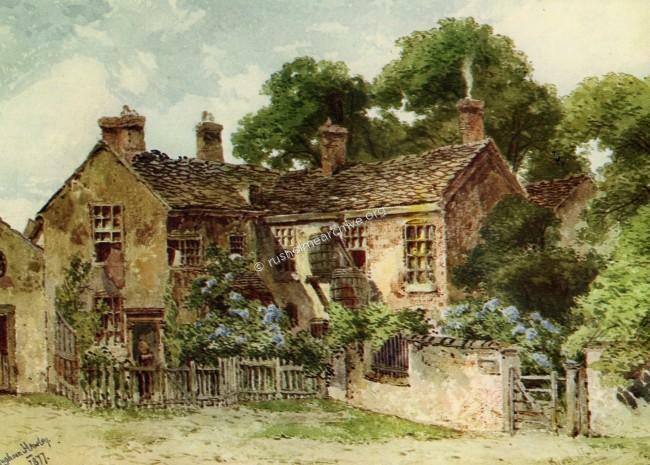 The watercolour below is of Birch Hall Farm and is dated 1877. Dedicated to the memory of William Royle of Rusholme (1854-1923).